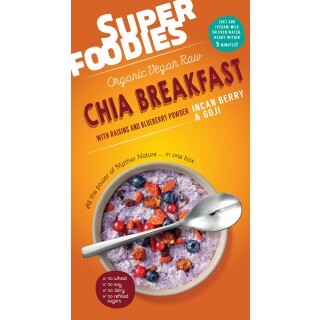 A delicious breakfast mix made from chia seeds and coconut, and flavoured with juicy goji berries and incan berries. Just add water and it's ready. A cheerful breakfast mix made from chia seeds, Oats and coconut, and flavoured with juicy berries, raisins and Incan berries. Just add water and it's ready to eat. The chia seeds contain 1.8 grams of omega 3 fatty acids. 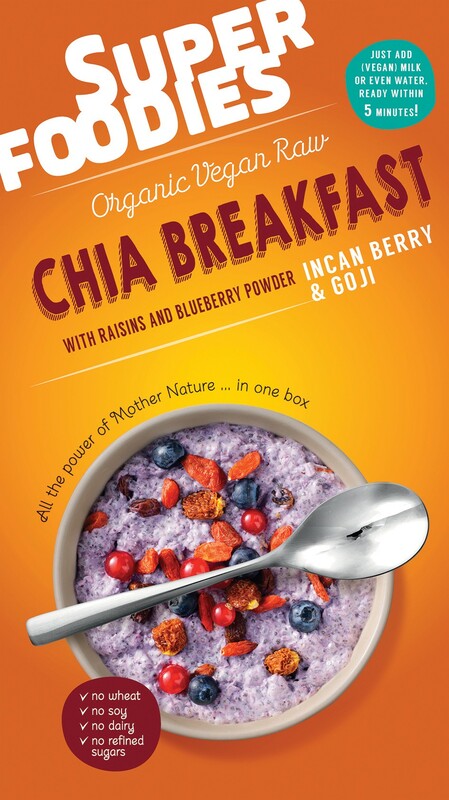 Ingredients: ;oat flakes*, dried coconut fine flakes*, ,chia seeds(9.9%)*, raisins*(8.65%), dried goji berries* (4%), Incan Berries * (4%), blueberry powder*, lime powder, vanilla powder*, pink Himalayan salt. For allergens see ingredients in bold. The oat flakes used in this product may contain traces of gluten from other cereal crops. For one serving: pop 3 or 4 tablespoons of Chia Breakfast Mix into a bowl and pour in a least twice as much water. Stir thoroughly and then leave to stand for 5 minutes or until the chia seeds have absorbed all of the water. Store in a tightly sealed container and in a cool, dry place. Once opened, consume within 2 months. 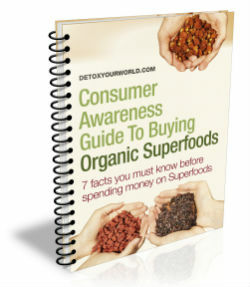 Superfoodies is the exciting new brand from Detox Your World - the UK's leading importer and EU-wide distributor of the finest raw foods since 2000. Combining expertise in healthy eating and healthy living, with extensive product development using only the purest organic ingredients from nature, Detox Your World has produced Superfoodies! Superfoodies products cater directly to health-conscious consumers, who are looking to combine an active and healthy lifestyle with great-tasting, organic food. Never has eating healthily and feeling great been made easier, or more fun for the consumer. At Superfoodies we passionately believe that Mother Nature has provided us with all that we need to nourish our bodies and live a long healthy and happy life. We’re proud to give her a helping hand with a superb selection of great tasting organic nutrient dense products. Contains gluten and almonds. Packaged in an area where other nuts, sesame seeds and gluten-containing products are processed.